What can I say? This is delicious! I made the buns with my regular bread recipe. The original sandwich recipe called for seasoning the chicken with poultry seasoning, which I did not do. It just didn’t sound good to me. I seasoned the chicken with salt and pepper. Bacon-Provolone Chicken Sandwich Click the link for the original recipe. Cut the chicken breasts in half [the ones from Butcher’s Block are huge], then cut the larger end piece horizontally. Two large breasts will make enough for six sandwiches. We used three pieces for supper and had three leftover for lunches. If the chicken is thick, you can place it between plastic wrap and pound it flatter, so it cooks more evenly. Fry the chicken on both sides until done, seasoning to taste with salt and pepper. Don’t overcook it or it will dry, but be sure it is cooked thoroughly. I used my instant read thermometer to check the internal temperature. Perfect! Top with lettuce (and onion, if desired). 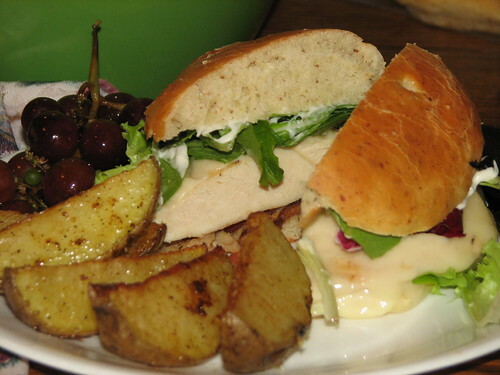 Spread mayonnaise on cut side of roll tops; replace tops, and serve. This entry was written by ~~Rhonda, posted on January 20, 2010 at 3:04 pm, filed under Recipes and tagged bacon-provolone chicken sandwich, recipe. Bookmark the permalink. Follow any comments here with the RSS feed for this post. Post a comment or leave a trackback: Trackback URL.